It's yet another reboot for the Knicks as a new NBA season is about to begin. All-Star Carmelo Anthony is gone, traded away as the team tries to rebuild with younger players. But it's not only the roster that's changing. NY1's Roger Clark reports. It was Game Three of the 1999 NBA Eastern Conference Finals when Larry Johnson had a pivotal four-point play against the Pacers. The NBA great is still part of the Knicks organization - with an up-close look at the team. "We got some young guns, we got a bunch of young legs, and guys that's really enthused about getting out and playing hard," Johnson said. The Knicks will have more than new faces. The team is unveiling their first-ever uniform advertising patches, featuring website builder Square Space, after the NBA gave the go-ahead to ads on uniforms. 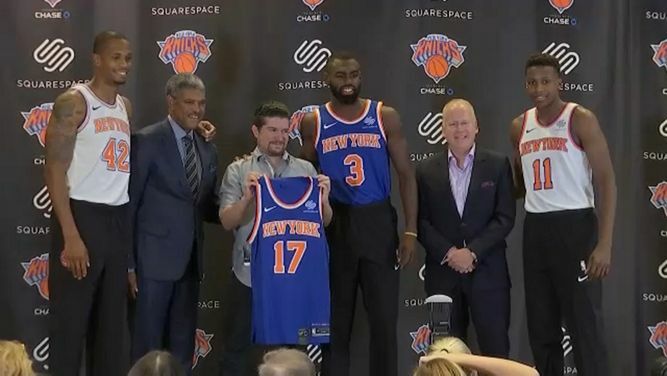 "We think there is a lot of synergy in terms of what we are trying to get accomplished between our companies, and we really look forward to this partnership," said Steve Mills, president of the New York Knicks. "It's a great way for businesses to get out there and show face," said Knicks Player Tim Hardaway Jr. The team wearing those jerseys opens the season Oct. 19 in Oklahoma City led by Kristaps Porzingis, trying to return to the playoffs for the first time in five seasons. "We want to put the right tools around him, I think we can build on that," Johnson said. The World's most famous arena is preparing for the Knicks' home opener against Detroit on Oct. 21. The Knicks City Dancers is getting ready too. "We spend a lot of time putting these pieces together. So much effort goes into it that is unseen," said Jess Attardo, captain of the Knicks City Dancers. "I'm so thankful every night when we get to go out on that court and be in this environment," said Knicks City Dancer Michelle Leonardo. "I mean the Knicks history is incredible and just to be a piece of that history is life changing." When you come to the garden to see a Knicks game, you have to eat. The days of getting a hot dog and a pretzel are of the past. You can still get them, but you can also get some new items like a Charlie Palmer Steak Sandwich. Returning favorites include Kobeyaki - maker of tasty chicken teriyaki bowls. Of course, delicious food doesn't equal baskets and defense. Long suffering Knicks fans are hungry for wins. "It's kind of a new era with young people. We are just looking forward to playing the season," said Knicks Player Frank Ntlinkina. The Knicks faithful is looking forward, too, hoping this year the changes will extent beond new food and uniforms to a winning season.